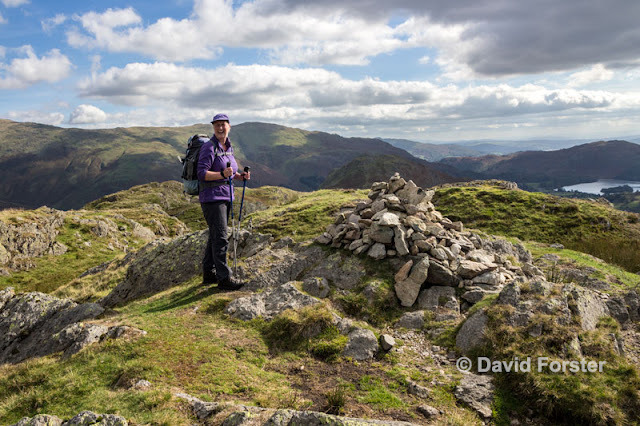 David BSI: Wainwright's - Steel Fell, Calf Crag, Gibson's Knott and Helm Crag. 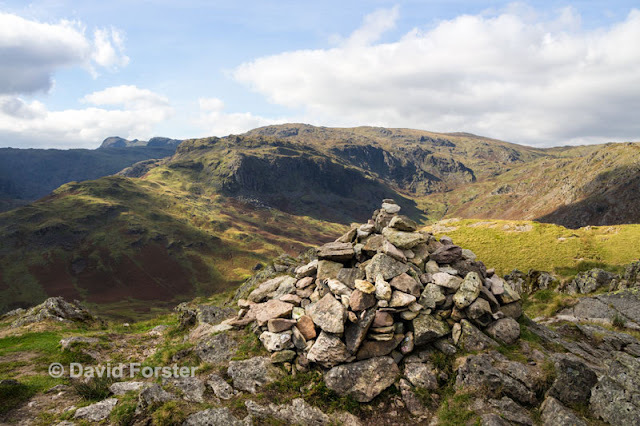 Wainwright's - Steel Fell, Calf Crag, Gibson's Knott and Helm Crag. Above the village of Grasmere the prominent outline of Helm Crag dominates the view to the north. 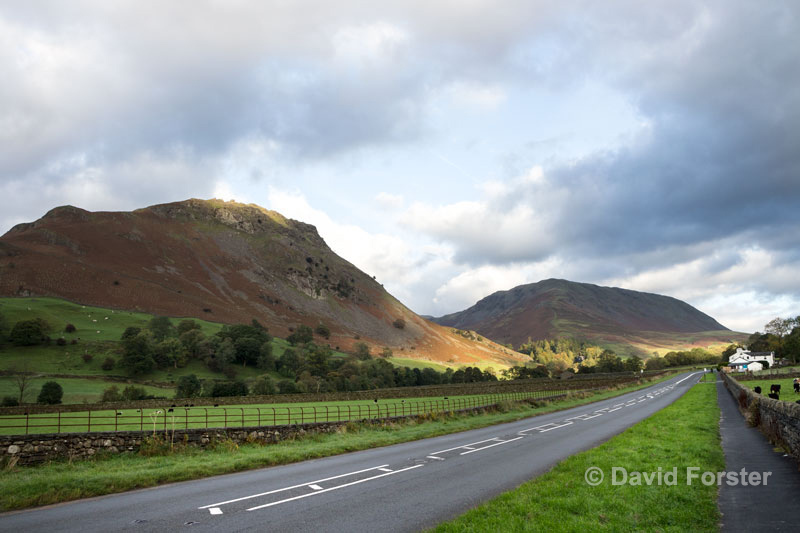 When viewed from the A591 road two pinnacles on its craggy summit attract the eye. 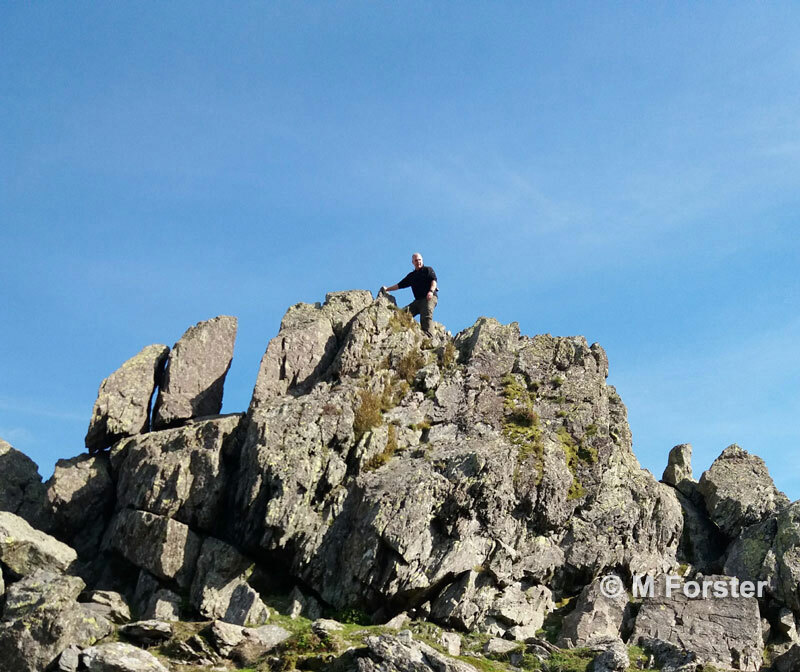 The Howitzer, the tallest of the two, leans out over the east face and is the true summit. A little climbing skill and a certain amount of nerve is required for the walker to stand on the rocky top and as a result many walkers are happy just to touch the base of the pinnacle and declare the fell achieved. For the Wainwright bagger it probably doesn't really matter if you climb those last few feet to the top or not, as Wainwright himself never managed to do it either. A little further to the south and just a little lower is another craggy outcrop known as the Lion and the lamb. This is a much easier and safer proposition, yet at the same time has plenty of exposure on its eastern side for those who would like to experience it. 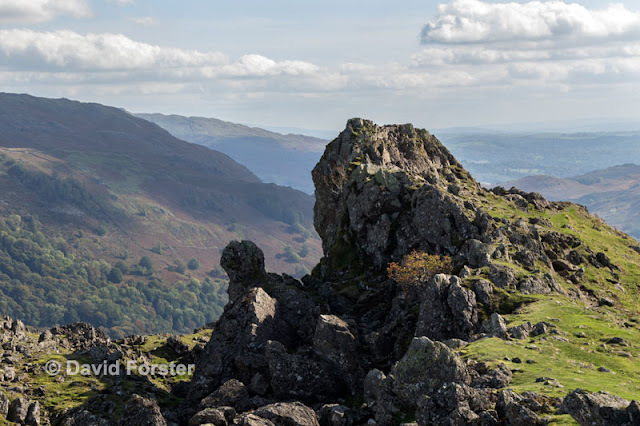 Running north from here a broad ridge containing 2 other Wainwright’s - Gibson’s Knott and Calf Crag. 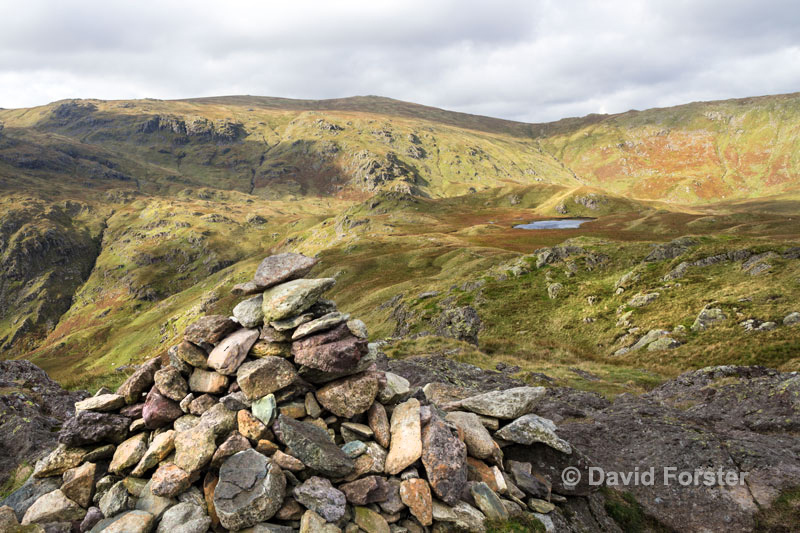 These can be linked via a certain amount of boggy walking to the higher Wainwright of Steel Fell to form a nice 4 top circular walk from Grasmere. Incidentally it doesn’t particularly matter which way you do this round, but we chose to climb the highest Steel Fell first and complete the round in an anticlockwise direction starting from the A591 a little south of Mill Bridge. Our reasoning behind the decision was nothing more than to have a pub at the end in Grasmere and to do the highest hill first. 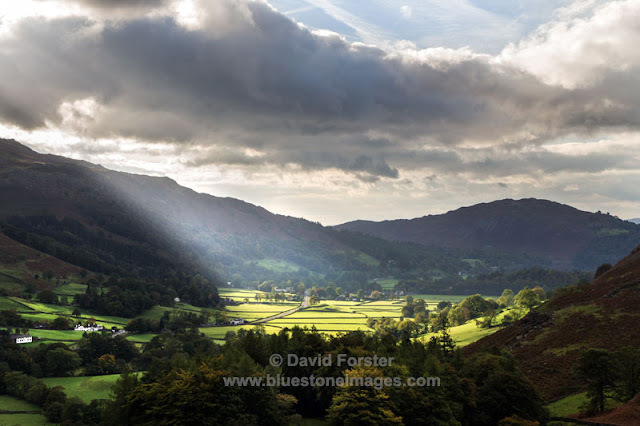 It was pretty cloudy when we set off, but a few breaks soon appeared and we were treated to some beautiful crepuscular rays sweeping along the valley. 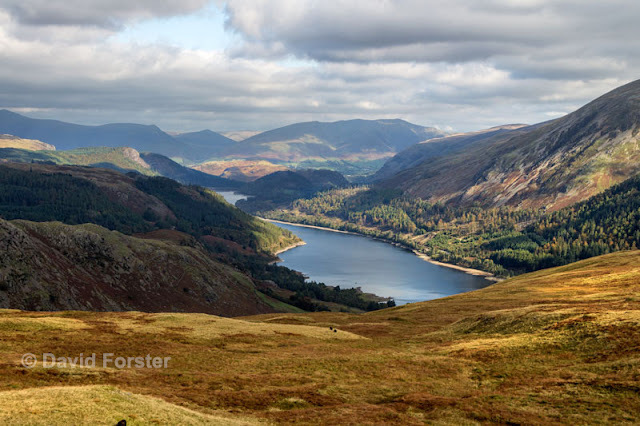 As we gained height the views opened out towards Helm Crag and beyond. The top of Helm Crag with the craggy outline of the Howitzer and the Lion and Lamb. The ridge leading right towards Gibson's Knott is our route back. From the summit we enjoyed some good views down Thirlmere while we had a break in the lee of some rocks. Despite the fact we had been down to T-shirts on the way up a nithering wind from the northeast meant we did not hang around too long. Moving on from Steel Fell we then tackled the undulating but very boggy ground which follows the remains of the boundary fence west to Calf Crag. 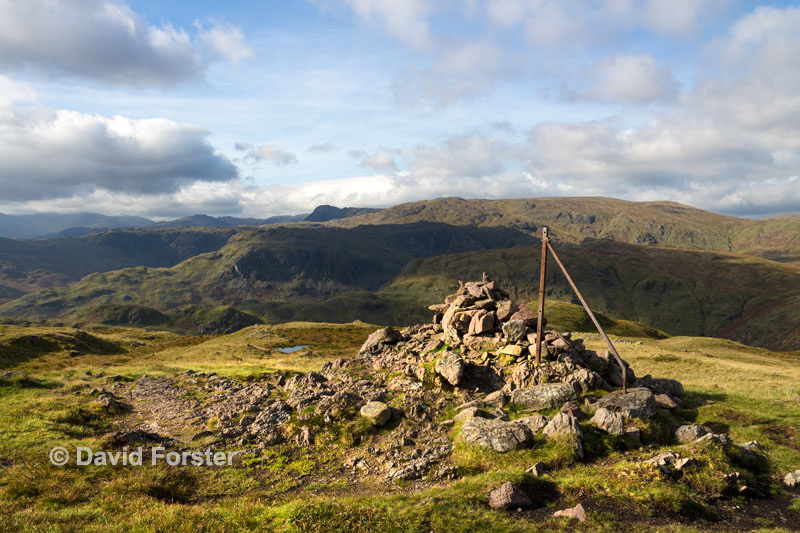 The view southwest over Tarn Crag towards Langdale, with Harrison Stickle and Pavey Ark th etwo craggy bumps on the horizon - I think? It was very windy and cold here so we tucked ourselves behind one of the many rocky knolls and had a break. Wrapped up as we were against a cold wind we were surprised to see quite a few folk up here just wearing shorts, although to be fair they did look rather cold. From here we struck south east over the undulating ground, taking in the top of Pike of Carrs to Gibson’s Knott. There was little wind here and it was really hot. No wonder those in shorts got a cold surprise on Calf Crag. It also shows just how localised the weather can be too. 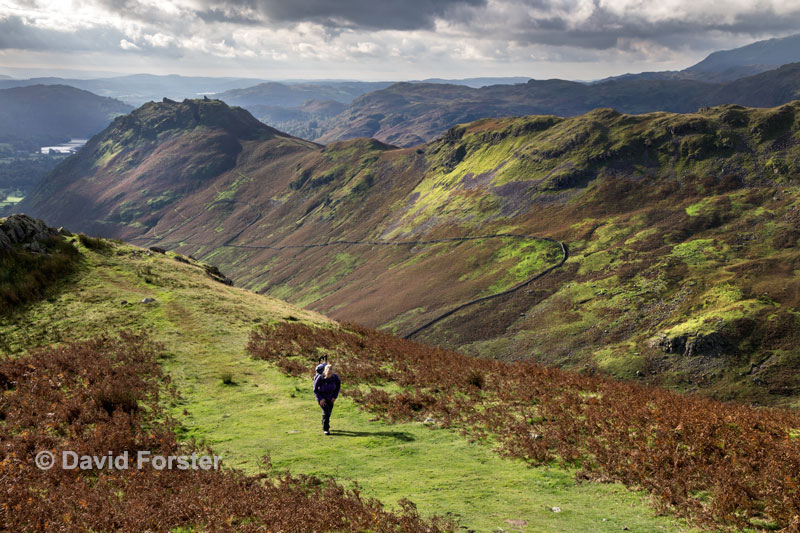 From Gibson’s Knott it was mostly downhill to Bracken Hause, before another up took us onto Helm Crag. The scramble up onto the Howitzer was fairly easy via its right-hand side, but the scramble down was a bit tricky. We then moved on to the Lion and the Lamb to enjoy the view from there as well. The path back down to Grasmere through the woods was quite a sociable affair with plenty of people still heading up the steep path and keen for an excuse to stop and have a chat. Back in Grasmere and having built ourselves up for a nice pint, we were left disappointed to discover that neither of the 2 pubs we tried had any ale on tap left.